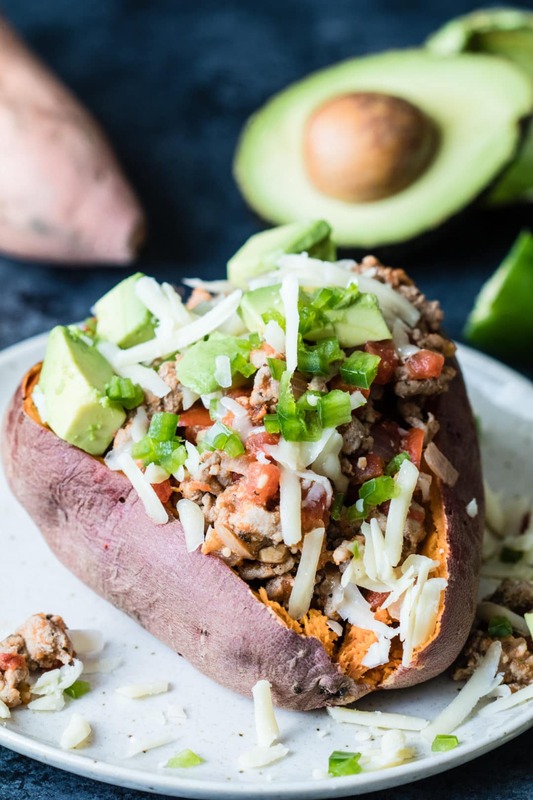 My favorite weeknight go-to dinner, Avocado Turkey Stuffed Sweet Potato! This recipe puts a fun twist on a traditional baked potato with sloppy joe mix. I love how colorful this meal is and how it is loaded with healthy fats, low in sodium, and high in protein. This is one of my “go-to” dinner options because it is easy, healthy, and down right delicious. I always find ways to add avocado to my meals and a site I visit often is: http://www.avocadocentral.com/loveonetoday. They have great recipes with using Hass avocados and nutritional information on their website. As you most likely are aware of, avocados contain the “healthy” type of fat. Avocados contribute good fats to one’s diet, providing 3 grams monounsaturated fat and 0.5 polyunsaturated grams fat per 1-oz. serving. Also, avocados are cholesterol- and sodium-free, and more than 50 percent of the fruit’s fat content comes from monounsaturated fats. My FAVORITE go to dinner - easy, healthy and completely satisfying. 1 ripe Hass avocado halves, seeded, and diced. With a fork, pierce sweet potatoes all over several times. Place on a baking sheet lined with aluminum foil; bake until soft and fork tender, about 45 minutes. OR pierce with fork and cook in your microwave until soft & tender (I liked to wrap mine in a paper towel). All microwaves vary on time. Heat oil in a deep skillet over medium heat. Add onion, bell peppers and garlic; cook, stirring occasionally, until tender, about 5 minutes. Stir in garlic powder, red pepper chili flakes, cumin, oregano and salt. Add turkey; cook, stirring and breaking it up with a spoon, until no longer pink, 3 to 5 minutes. Stir in tomatoes. Reduce heat to medium-low; cover and cook 20 minutes. Remove from heat and stir in avocado (or just garnish when ready to serve). Slice baked sweet potatoes lengthwise just until open. Fill with turkey mixture. Top with cheese & additional avocado. 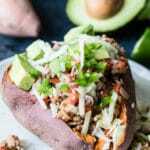 Sweet potatoes and avocados are two of my favorite foods, so this will go on my list of recipes to make! 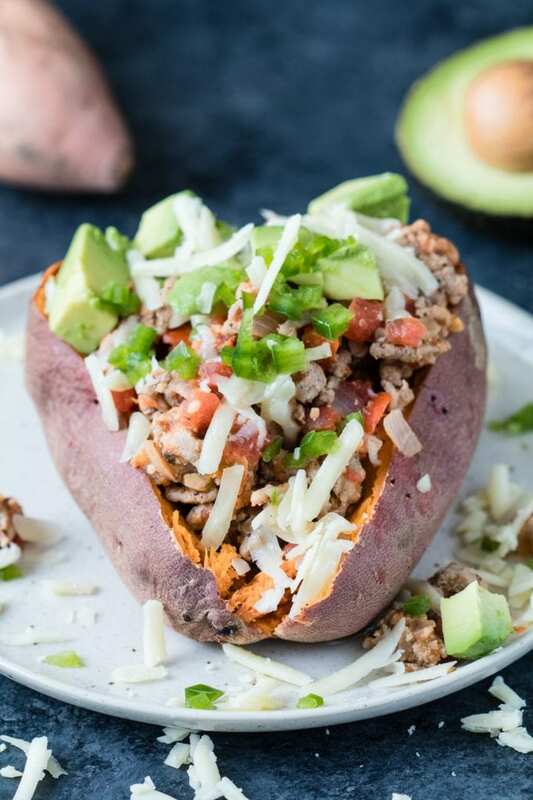 I adore stuffed sweet potatoes! This combines a whole ton of things I love in one! 😀 Can’t go wrong with that avocado! !